Foreigners in MandarinGarden how to celebrate Christmas? Decorate a Christmas tree in the living room; Cooked an authentic American dinner; Watch a Christmas film; Waiting for two kids fell asleep, parents quietly tucked presents in the stockings...the Jimmys Christmas is normal and sweet. Jimmy come from America, a foreign teacher in college, and learn language Chinese in MandarinGarden. This is the first Christmas he spent in China. "Homesick is inevitable, but we're thankful the present life. Actually, the most afraid of in a foreign land is spiritual loneliness, but we did not feel isolated in China." Jimmy said. The French Jenny’s family, together with the other two families for the festival. Three French families, 12 people, from Shanghai, Brittany and Singapore. "About a month ago, we had a meeting to assign their tasks." Says Jenny. Jenny’s family prepared for Christmas Eve dinner all the day. In France, she says, the Yule cake is an essential part of Christmas Eve dessert , "just like Spring Festival in China must eat dumplings". To Jenny’s delight, Catholic church of Shanghai is not far from her home, before dinner, 3 family went to the church. When I saw polish students Kang Qingshi in MandarinGarden, he was with a Christmas hat, dance to sing "jingle bells", won the other students laughed. 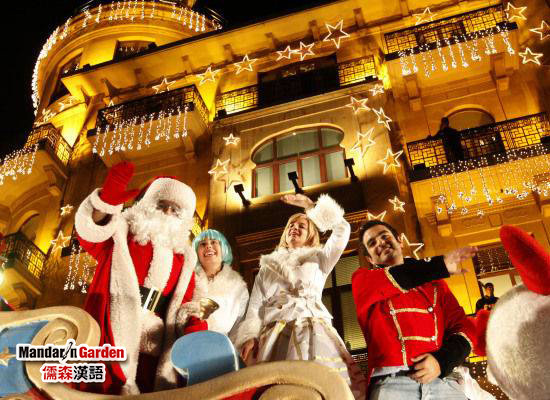 "I think China’s Christmas have unexpected surprises, here is more lively, and more place to have fun. I think this is ‘Chinese-style Christmas." He said.